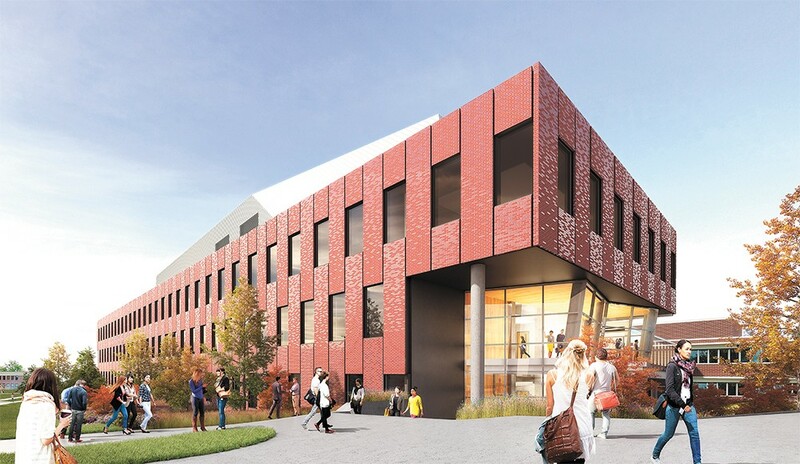 Eastern Washington University is waiting on $67 million to build its new Interdisciplinary Science Center. Every night in downtown Spokane, Hope House women's shelter turns away about a dozen homeless women for lack of space. By late next year, organizers could be breaking ground on a new building that will shelter three times as many people. They could be. But they won't. Instead, the board of the Volunteers of America-run shelter, which currently sleeps about 40, has postponed plans for a new 150-bed shelter because, for the first time in modern memory, Washington state legislators didn't pass a state capital budget for this two-year cycle. That left $500,000 of funding earmarked for the project up in the air, so at the earliest, the new shelter will now break ground in late 2019. It's one of dozens of building and maintenance projects around Eastern Washington that have been put on hold after lawmakers negotiating over water rights legislation unrelated to the capital budget didn't reach a compromise during the longest legislative session in state history. Republicans who control the Senate maintained that until lawmakers passed a solution to water availability and building permit issues that arose from an October 2016 Washington State Supreme Court ruling known as the Hirst decision, they would not allow a vote on the more than $4 billion bipartisan capital budget, a similar version of which passed the House 92-1. While some wait to see if a race in the 45th District could turn control of the Senate over to Democrats this November, new university science buildings, new K-12 schools, affordable housing, dental clinics, environmental cleanups, and many other projects have had to adjust course and hope the money comes soon. For Hope House, the money coming from the legislature as part of a cross-laminated timber feasibility study is a relatively small portion of the roughly $16 million needed to build both the new shelter space and 50 units of permanent supportive housing, says Fawn Schott, president and CEO of Volunteers of America of Eastern Washington and North Idaho. However, the uncertainty of that coming through made delaying the project logical. "Our board made some risk assessments and determined without the capital budget and things secure on the legislative side, we felt as if we were best to hold for one more year," Schott says. In the meantime, that means fewer homeless women getting into housing. "Hope House is extremely successful in being able to house women," Schott says. Of 324 individual women who accessed the shelter last year, 108 were able to find stable housing with help from a dedicated staff member. "When we can have 150 women in our care every night being able to have those conversations, we really believe we can have the ability to almost eliminate homelessness for women in Spokane," she says. Third District Democratic Rep. Marcus Riccelli, who represents much of Spokane, says Senate Republicans are holding the capital budget hostage and possibly setting a dangerous precedent. "This is a reckless use of power," Riccelli says. "We could link a lot of things we want to the capital budget. I want to see a voting rights act pass, and equal pay, but we don't link that to the capital budget because it's never been linked to a policy bill." But Republicans insist something has to be done about water, and fast. Before the Hirst decision, counties had relied on guidance from the state Department of Ecology to determine whether there was enough water available for new residential wells while keeping the flow of rivers and streams protected. But in Hirst, the court ruled that Whatcom County had violated the state's Growth Management Act by relying on Ecology's guidance, and in the future needs to figure out if there is legal water available for every project. Since then, counties including Spokane have scrambled to change rules, in some cases requiring building permit applicants to submit hydrology studies showing that a new well would have enough water year-round, and in other cases, not issuing permits for sites that had already been prepared. Riccelli says there needs to be at least a two-year fix while lawmakers figure out a more permanent solution, but reiterated that it shouldn't be tied to capital projects statewide. Importantly, even if the 45th District race turns the Senate control over to Democrats, Riccelli says, it still takes a 60 percent vote to fund a good portion of the budget, which relies on bonds. Republican Sen. Mike Padden, who represents the 4th District covering Spokane Valley and nearby areas, has said House Democrats are responsible for holding up the water legislation, telling constituents in a letter this summer that lawmakers felt the need for extreme measures — tying it to the bipartisan capital budget — to get something done. "Only when we insisted on a Hirst fix before we would consider a capital budget did they enter into negotiations," Padden wrote. "Because House leaders refused to pass a bill to solve the water problem, no capital budget was passed, either. The failure to pass this $4 billion budget was as painful for us as it was for our colleagues from Seattle." Not having a capital budget approved is also costing jobs. Ten workers with Washington State Parks were laid off last week, Tacoma's News Tribune reported, and thousands more jobs are tied to capital projects. At Eastern Washington University, about 50 jobs are linked to capital funding. Ten of those people are in the process of being laid off and will be separated from the university by mid-December, says Dave Meany, an Eastern spokesman, though it's not clear what would happen if lawmakers come together to make a deal before then. The university is also hiring fewer students to help with maintenance-related work: Last year they hired about 50, and this year it's down to about 20, Meany says. Regardless of the water fix, leaders at institutions like Eastern and Washington State University hope that funding comes through before it starts to snow. "What's really concerning is the winter coming," says Stacy Pearson, WSU's vice president for finance and administration. "Included in those budgets are things like snow removal. We had such a tough year last year; if we were to see something like that, it could be very impactful." There are some options, but losing $5 million just for preventive maintenance work would have a huge impact for WSU, Pearson says, especially considering there wasn't time to plan for the hit. Sat., April 27, 10-11:30 a.m.